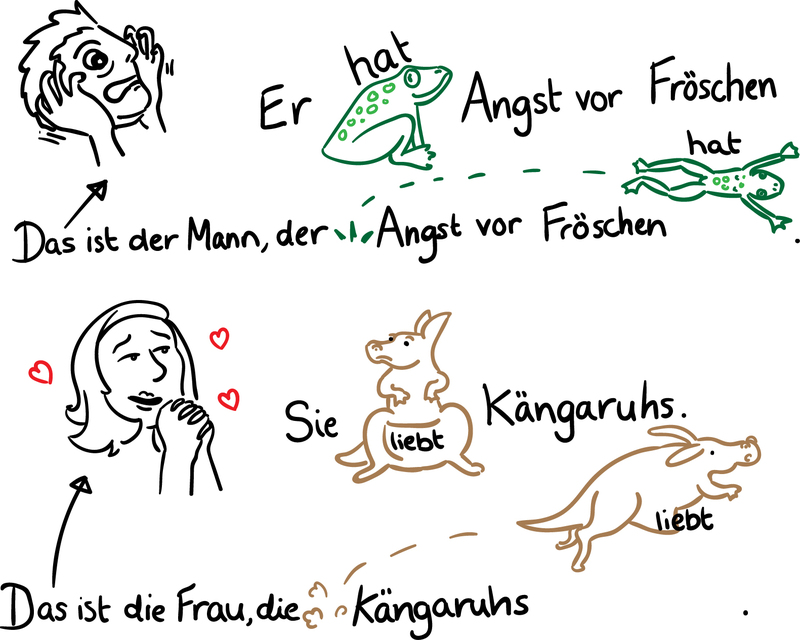 Guten Morgen Grammar: Relative clauses are about togetherness | Guten Morgen Berlin! December 4, 2015 December 15, 2015 - Guten Morgen Berlin! You know that guy who lives down the road and always parks his car across the zebra crossing? The car which has a lovely vinyl sticker of a soft-pornographic silhouette on its bumper? Well it doesn’t matter whether you know him or not, the second clause in each of those previous sentences were relative clauses: clauses which refer back to a noun which was mentioned in the previous clause, i.e. ‘..who lives down the road…’ (the guy), ‘which has a lovely sticker…’ (the car). We use them in English and German all the time; if you don’t believe me, try to keep an ear out next time you have a conversation with someone for the number of times you or your friend refer to ‘the something who/which…’. It’s a extremely useful construction and, if you hadn’t already guessed, it’s got a few important rules in German in order to get it right. 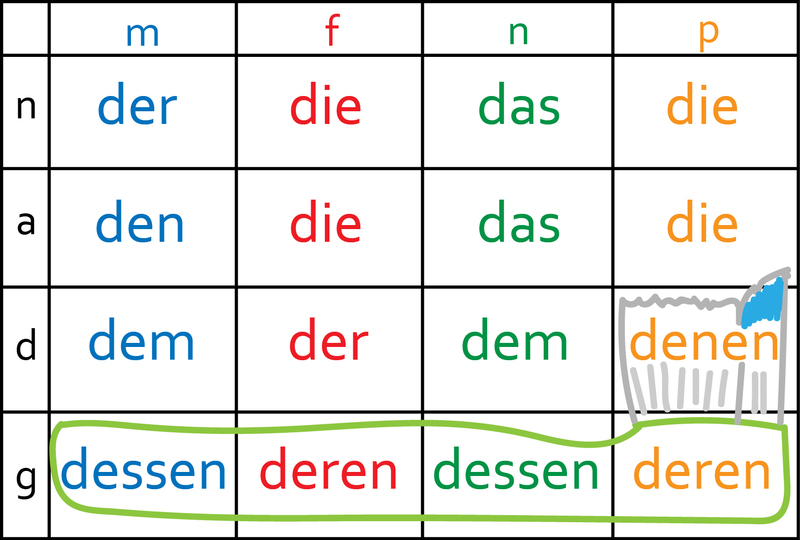 In German, we begin a relative clause with a relative pronoun. A relative pronoun is a pronoun which performs the role of the ‘who’ or ‘which’ in English, but puts in a bit more grammatical effort in German, because it changes to show the gender and case of the subject. Like the Magic Saucepan, the Magic Toothbrush helps us to remember the relative pronouns without the table; all you have to remember is all the relative pronouns inside the toothbrush, and remember that all the ones outside of the toothbrush are the same as the definite article. Easy. Is that the man who works at Microsoft? The relative pronoun has to match the gender of the noun it’s referring to, and the case of the noun as it is being used within the relative clause. If that sounds weird and confusing, just think of a sentence using a relative clause as a house and its garden: your tomcat is male whether he’s in the house or in the garden, but in the garden he gets rained on and in the house he’s warm and comfy. The location (clause) he is in changes the situation (case) he is in, but doesn’t change the fact that he’s an adorable and manly cat. Ist das der Mann, der bei Microsoft arbeitet? To keep things nice and clear, the relative pronoun comes directly after the noun to which it refers. What if we wanted to say ‘Is that the Microsoft guy who you saw in the Apple store’? Now the man is the accusative object of the second clause, because you – the person doing the seeing – is the subject, and he is the thing who is being seen. So we need a masculine relative pronoun in the accusative case: we need ‘den‘. Ist das der Microsoft-Typ, den du im Apple-Laden gesehen hast? I love the computer you gave me! Ich liebe den Computer, den du mir gegeben hast! That’s the dog that always pees on our lawn. Das ist der Hund, der ständig auf unseren Rasen pinkelt. I’m looking for a book which I can read in the plane. Ich suche ein Buch, das ich im Flugzeug lesen kann. Woah woah woah. Hold on. Something else is going on there, isn’t it. Yep, much like subordinating conjunctions, relative pronouns send the verb to the end of the clause. 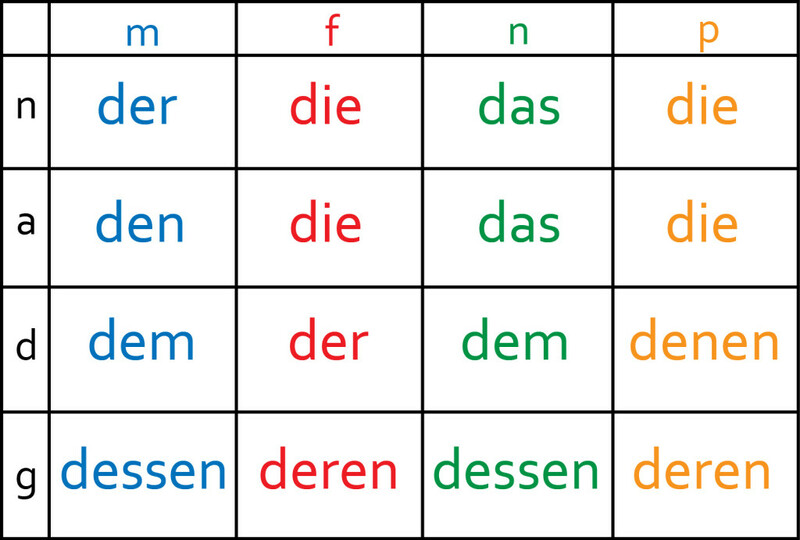 And that’s really all you need to know if you’re just starting out learning German. 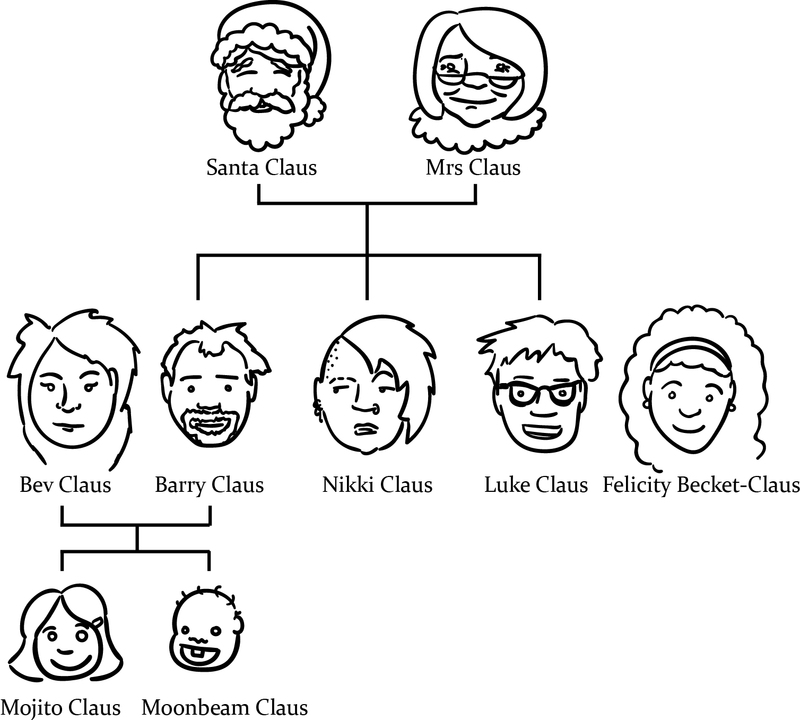 For a relative clause, just make sure you have the right relative pronoun and send the verb to the end. Take another look at those examples to see it happening. At first, it’s best to get comfortable practising relative clauses using either the nominative or accusative case. We’ll have another lesson about using relative clauses with dative and genitive cases in a couple of days so by then I expect you to be bloody brilliant at these ones. Until then, why not practise using the exercises below! Look up any vocabulary you don’t know and note it down for future use. Choose the right relative pronoun for each sentence! Er mag Kaffee, ____ ganz kräftig schmeckt. Frau Blucher ist die einzige Kellnerin, ____ uns nicht begrüßt. In Friedrichshain gibt es eine Bibliothek, ____ fast niemand besucht. Berghain ist der Club, ____ alle Touristen besuchen wollen. Nimm nicht das Stück, ____ der Hund angeknabbert hat. Magst du den Wein, ____ ich bei Lidl gekauft habe? Ich mag nur Filme, ____ lustig und phantasievoll sind. Berlin hat ein öffentliches Verkehrssystem, ____ relativ zuverlässig ist. Sie scheibt für eine Zeitung, ____ ich aber selten lese. Wir trinken immer Mineralwasser, ____ von den Bergen kommt. We have an old dog who smells terrible. I only cook with ingredients which come from Germany. She’s a great journalist who I really envy. I’m selling the vacuum cleaner which I never use. Do we have the orange juice which Mum buys from the market? Here’s the email my boss finds inappropriate. I don’t understand the people who like Kim Kardashian. I have a good dentist who is very understanding. We’re going to a restaurant which has good TripAdvisor reviews. He has a laptop which he found on Craigslist. Tune in next time for ADVANCED relative clause action!